One of the great pleasures of coming across travelling singer-songwriters is the enlightening stories that accompany their songs which often form an integral part of their live performances. Belfast born artist Andy White has taken this one step further with his latest release by including a combination of songs and narrations spaced across a two-disc set. The real inspiration behind the release is to adapt his 2009 book of the album’s same title 21st CENTURY TROUBADOUR. The stories disc comprises of Andy reading extracts of his travelling memoirs set to background music, a poetry adaption from his 2011 book STOLEN MOMENTS and an eponymous track appropriately titled ‘21st Century Troubadour’. The striking, poignant and often humorous observations of a transient life very much on the peripheral of rock ‘n roll are designed to take the listener on that journey and succeeds in capturing your attention for its almost hour-long duration. The most memorable part of the narration comes early on when Andy contrasts U2’s ‘Where the Streets have no name’ statement to the life of a lonely troubadour where every street has a name and often lead you to the venues and hotels you’ve booked. For those of you new to the work of Andy White, he has spent close to thirty years recording music and working alongside industry giants such as Peter Gabriel, Van Morrison and the Finn brothers. For this unique release, Andy has chosen to include fourteen tracks from his back catalogue that have been essential to the rich heritage of experience captured in the book. 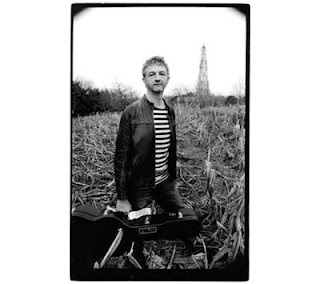 The songs spanning from Andy’s 1990 album HIMSELF to his most recent record 2009’s SONGWRITER are an eclectic selection that catch a mixture of his sound, covering pop, rock and folk. The two standout tracks for me are the ones which reflect a more stripped down acoustic sound. ‘Berlin 6 AM’ a song written around that city’s most important recent event was also related to a specific episode in the book, while the folk credentials of ‘The Fortune Teller’s Right’ with its harmonica interlude will resonate with any roots music fan. Another memorable song chosen which is aligned with Andy’s international status is the catchy ‘Italian Girls on Mopeds.’ Yet despite being based in Australia for a decade, Andy is always keen to hark back to the songs originating from his native Ireland and ‘Twelfth of July’ is a perfect example of his Belfast commentary. This release presents itself as a concise introduction to the world of Andy White. A special mention also needs to made of Andy's exceptionally informative website and excellent sleeve notes.The upcoming UK dates designed to promote his work are the perfect opportunity for music enthusiasts to engage further with an insightful artist who expertly fuses the spoken and written word with a diverse sound. 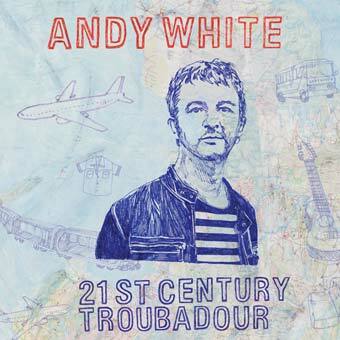 One day, 21st century troubadour will inevitably be the epitaph of Andy White, however in the meantime, long may there be many more releases of travelling tales to fuel the desire of fans of high quality singer-songwriters.